An American newspaper has apologised to Glasgow Labour MP George Galloway after alleging that he accepted millions of pounds from Saddam Hussein. The Christian Science Monitor has admitted that a set of documents upon which it based its story on were "almost certainly" fake. 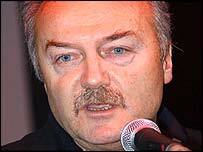 Mr Galloway has always strenuously denied that he took any money from the Iraqi regime. The newspaper said two of the "oldest" documents - dated between 1992 and 1993 - were actually written within the past few months. Paul Van Slambrouck, Monitor editor, issued an apology both to Mr Galloway and the paper's readers. He said: "At the time we published these documents, we felt they were newsworthy and appeared credible, although we did explicitly state in our article that we could not guarantee their authenticity. "It is important to set the record straight. We are convinced the documents are bogus. We apologise to Mr Galloway and to our readers." However the Glasgow MP has refused to accept the apology and is demanding to know who forged the documents. He said: "This newspaper published on its front page in every country in the world that I had taken $10m from Saddam Hussein. "That was a grave and serious libel. "Of course the documents were a forgery and a newspaper of that importance ought to have made the effort, both morally and legally, to establish the authenticity of those documents before they published them." Mr Galloway also called for the prime minister to investigate the source of the documents. "As a member of the House of Commons, indeed as a British subject, I have the right to the protection of the British intelligence services from a conspiracy hatched by persons unknown but whose handiwork was conducted in foreign territory co-occupied by Great Britain," he said. He pledged to continue his legal action against the newspaper, which is published by The First Church of Christ, Scientist, in Boston, Mass. Mr Galloway is currently suspended from the Labour Party over comments he made in an interview to an Arab television station branding Prime Minister Tony Blair and US President George Bush "wolves". Both the Parliamentary Standards Commissioner, and the Charity Commission, are also conducting investigations into allegations that he accepted Iraqi cash. The chairman of Mr Galloway's constituency Labour Party, Mark Craig, said the apology from the Christian Science Monitor was a "vindication" of the MP. He said he believed similar allegations by the Daily Telegraph were also false. But in a statement, Charles Moore, editor of the Daily Telegraph, said: "The Christian Science Monitor's retraction has no bearing on The Daily Telegraph's story. "Our story was based on a different set of documents found in a different set of circumstances. They were not supplied or given to us but unearthed by our reporter, David Blair, in the foreign ministry in Baghdad. "We have complete confidence in our story, our reporter and the authenticity of our documents." "It [Christian Science Monitor] now accepts the papers it was given were forgeries"